On the left hand side you will see your navigation tools: your My Drive Folder (with a drop-down arrow to access all the folders you create), your Incoming (for files shared with you), Recent (where you can quickly access the documents you’ve worked on most recently), Starred(you can mark important documents with a “star” for quick access), and Trash (where documents you delete are stored for 30 days or until you empty the trash). The core suite of Google Apps within Drive allows you to create a Doc, a Sheet(spreadsheet), Slides (presentations), and Forms (a great tool that you should explore as you become a more advanced user). Creating a new document in Google Drive is simple. Click on the red “New” button in the top left and select the type of document you would like to create. When you have done this, a new tab will open with your blank document. To title it, simply click on the “untitled document” in the top left and then enter the new name. 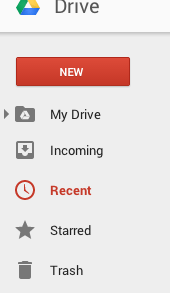 One of my favorite features about working within Google Drive is that all changes are saved automatically. I don’t have to remember to hit save before logging off of my machine. You will be able to access the most recent version from any machine with a web browser and internet connection. For example, if you want to share a document for input, but don’t want the viewer to make any changes, then “comment” is the appropriate level of sharing. Those with access can read and leave comments throughout, yet they cannot change the text itself. 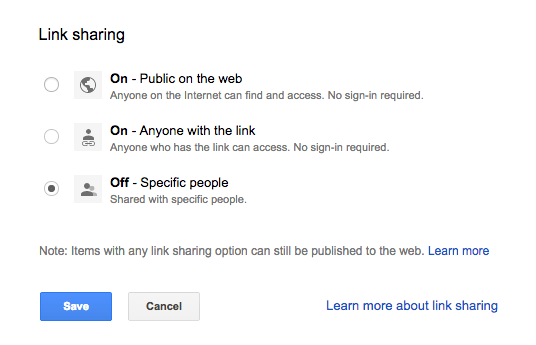 Good Drive promotes collaboration, so other people can share with you the same way. When a document is shared with you, it will appear in yourIncoming folder. You can access it from there, or move it into My Drive for better organization. 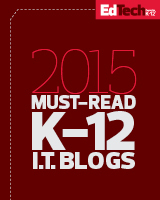 Learn more about Google Apps this Summer with EdTechTeacher! This entry was posted in Education, Educational Resources, Educational Technology, Google, Professional Development, Technology and tagged Education, Educational Technology, GAFE, Google, Google Apps for Education, google drive, Technology on February 6, 2015 by Jennifer Carey.